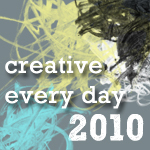 Join in the Challenge: You can sign up for the 2010 Creative Every Day Challenge anytime! Find out more and fill out the sign-up form here to join in! Ways to share: Once you've signed up, you can leave a comment on this post and/or use the "Mr. Linky" widget below to link to a blog post(s) about your creative activities during the days of 4/26/10 - 5/2/10. You can also take advantage of the great CED flickr group to post your images and see what others are up to. If you're on Twitter, there's a growing Twitter list of CED participants and you can use the hashtag #CED2010 to help others find your Creative Every Day tweets! Theme: The (totally optional) theme for April's theme is The 5 Senses. I'll be posting about the theme throughout the month and you can feel free to use it to inspire your creations, follow your own muse, or do some combination. You can find out more about this month's theme and some prompts to get you started with it here. Enjoyed spring this week and a weekend visit to one of my favorite places this weekend. Also discovered one of the most soul draining activities for me last week at work – which is good because now I can avoid it! Happy Creative Monday to all! gardening, gardening, gardening….great week for it. perfect weather for digging in the dirt, and making the most of every moment. knitting was a 50% success rate, so the other 50% to complete this week. Writing for submission this week, gardening as weather permits, and enjoying life. Enjoying nice walks with the dogs in the sunshine. Even though it was cooler this weekend, it was still sunny. I love spring when the leaves are unfurling more each day and a new surprise awaits you in the garden. It may be the Tulips or the Bleeding Hearts, the Bee Balm or the Mint popping through the soil but whatever it is, it’s like a little gift from Mother Nature each day and it fills your soul with happiness and tickles your creative muse into action as you transfer all the colors, shapes, smells and even the sound of the birds onto your “palette” of the moment, whatever that palette may be! Loving the contiuation of “A Melody a Day” that was inspired the month of “stories”:) Moving into textures, fibers this week…still enjoyint the senses! but this week i am focused on creating my “creative with money creativity kit” which is A BLAST to work on. i am creating paintings and putting all of my best abundance workshop material together into it. my goal is to finish the draft THIS WEEK. The weather outside San Francisco Bay is starting to turn Spring-y. I love it. I’ve been able to get out on my road bike and get some much needed exercise. It’s wonderful to be out in the sunshine, feeling the air, letting my body work its magic. Sometimes, it’s so weird to post here at the beginning of the week, as I have no idea what I will be doing creatively over the course of the week. Surprises. Now, about dinner . . .
I’ve been out of the creative loop for awhile…and am feeling creative again! I am really excited about the intuition theme in May…looking forward to see what that one brings out for everyone! The start of spring sends my senses spinning, love all the new beginnings I see everyday! I uploaded a video of me painting Johnny Cash, and worked on making 4×5 reproductions of the painting for my etsy shop. I’m very excited to be drawing again! Forcing myself to be quick and finish means that I am able to produce a few final products in these hectic days – mistakes and all. I can’t wait to get out and explore everyone’s sites this week. Last week was school vacation and we completely redid my teenage daughters room. I had little time for art, you all, or anything else. I look forward to some ME time this week. I have been so busy I need to take some time for creativity,I think it is good medicine to create something,even if you don’t finish.Lately I have not finished to many projects.I think the nice weather has something to do with it. Hooray for intuition! We should always listen to it. Trust it. Turning the soil, listening to the sea rolling in, feeling that lime green and sometimes mauve read new growth on the fir trees, and song birds of such variety I do not know all their names…. I am changing my Creative Potager schedule to Tuesday and Thursday post from the beginning of May until the beginning of September. I think that my desire to be outside so much has been inspired by your theme for April Leah. Thank you. Painting a series of small canvases. So happy to be back to experimental work instead of having a looming deadline. More play to come. I’ve been longing for May so much… More sun, more flowers showing off pretty colours, getting closer to SUMMER and finally finishing my Master degree. Soon soon SOON!! I hope you all enjoy spring! Finally signed in for this week. Just posted on my blog about the challenge of keeping up with my creative practice when life is busy & my health is difficult. Hope you all are having a happy & creative week! Smelling the roses on my desk every day this week led me to the project of sketching them daily. The first two sketches are up on my blog. I was writing a poetic list for each of the senses, and I noticed that sight and touch have been the most powerful for this past month, particularly the sense of touch. That amazes me…an eye-opener really. But you know, it makes sense because I’m a very tactile person. I am going to participate in “Every Day in May” a challenge started by http://blog.frenchtoastgirl.com/ a couple of years ago. Find more on my blog . Leah- I’ve been enjoying all of your new paintings ! Maybe moving and having an art studio has inspired You ?